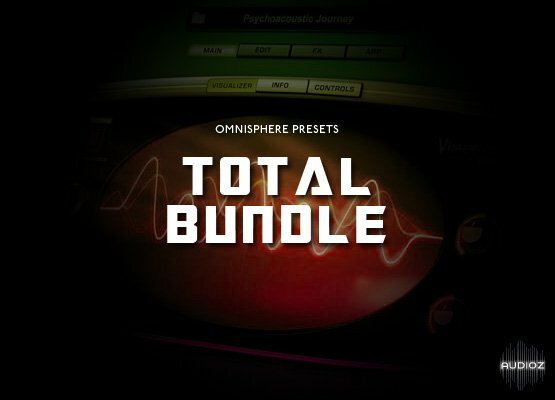 Omnisphere TOTAL Bundle includes ALL Audiority Omnisphere soundbanks produced so far. This page (as well version number and price) will be updated on every new release for Spectrasonics flagship synthesizer. Full version of Spectrasonics Omnisphere 2.2.0g or higher is required. Legacy version requires full version of Spectrasonics Omnisphere 1.5.7d or higher. Audiority Omnisphere TOTAL Bundle v14 has been exclusively released on AudioZ by Talula who chose to ask not to post mirrors. Format is not Wav, these are usual presets for omnisphere, that include some wavs as subtitle says. Perfect!! ... Thank you very much!! Thank you so much! Amazing release! For those who have the soundbanks included here, you need to install only Magnitude II which is updated. Thank you!! great to try these. This is awesome! Thank you so very much for sharing this!!! Please repost or fix broken link in RG. What do you mean? RG links working. Thank you very much Talula! I would like to know if these sounds are included or not in the pirate's awesome omnisphere release of two weeks ago. Can someone confirm please? there's nothing kind about man.